One cold morning in 2007, a man stood inside the entrance of a Washington, D.C. subway station and played the violin. Occasionally, the people walking by tossed money into his violin case or, in extremely rare instances, stopped for a minute to listen. Mostly, they kept going, eyes fixed anywhere but on him. Playing for a mobile audience of 1,000 people over the course of 45 minutes, the violinist made $37. That violinist was Joshua Bell, widely regarded as one of America’s best and most famous classical music interpreters. The now-notorious experiment, conducted by The Washington Post to determine whether a person’s innate appreciation for beauty could override their rush hour routine, called attention to the plight of subway buskers. Five years later, in New York City, these performers are a familiar sight to anyone who rides the train. Passing from one track to another, commuters might find themselves caught in the glorious cacophony that can arise from the exertions of a single drummer, his beats echoing off the walls. Doo-wop groups set up shop mere feet from where the trains pull in. Most days of the week, a mariachi band executes a delicate balancing act, the members playing their way through the moving MTA cars. A guy with a didgeridoo confounds neophytes to Australian aboriginal music with the duck-like sounds he produces. But in a world where people increasingly glue themselves to the phones in their hands and the music pounding from their headphones, how do performers reach them, either to give them a transcendent musical experience or to convince them to drop a crumpled bill into a tip jar so that rent can be paid on time? Pogady, who came from Slovakia to earn a Master’s degree at the Manhattan School of Music, initially started street performing for fun with friends. In the third year of his Master’s program, however, he realized that busking could be a powerful tool for exposure. “Everyone passes through the subway, people who wouldn’t normally get to hear you,” he says. Now, in addition to playing professional gigs and teaching violin, he performs frequently in stations, complex classical pieces emanating from his instrument with ease. He has come to know the stations where the money flows freely (“The East Side is just terrible,” while the best spots “are usually the touristy ones,” he says) and learned not to look directly at people as he plays, so he doesn’t make them uncomfortable. If a couple of people stop to listen, it’s easier to build a crowd drawn by the spectacle. But even once performers learn the ropes, setbacks abound. A gulf of misunderstanding stretches between the police officers who patrol the NYC subways and the musicians who play there. Three different policemen, none of whom gave their names, maintained that the law forbids all performance in the subway, unless artists obtain a special permit. Buskers can apply for an audition with the city and, if deemed talented enough, they get to perform under a legitimizing banner in certain locations at set times every week. These policemen said they usually only gave warnings to banner-less musicians, but could arrest them if they wanted. 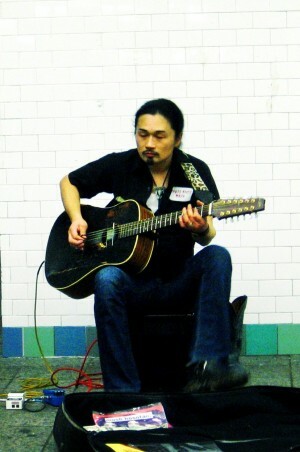 Yet the section entitled “Entertaining on the Subway” on the New York Police Department (NYPD) Web site states that “artistic performances on transit facilities are permitted” as long as they abide by a laundry list of rules forbidding amplification, specifying the number of feet performers must stay from token booths, and so on. Police officers have ticketed Wingate multiple times over the past eleven years, even though his actions were not violating any of the laws listed on the Web site. He estimates that he has been to court ten times, always successfully fighting his way out of paying the tickets given by cops who were unfamiliar with the rules. Morgan O’Kane, whose banjo playing produces more sound than one would expect to come from just ten fingers, says, “I’m chased and harassed by police all the time. It has become part of the job,” although he has also had positive experiences with cops who bought the CDs he was selling and listened to him play for hours. Still, it’s hard to find commuters who will publicly admit to disliking these hard-working musicians. Most enjoy and move on, like actress Carol Linnea Johnson, whose young daughter always asks, in anticipation of taking the subway, “Is someone going to entertain us?” Pre-school teacher Julissa asserts that “it makes waiting for the train much easier,” although she rarely gives money. Others, like filmmaker Matt Finlin, feel the effects in more momentous ways. Upon moving to NYC and “navigating the chaotic arteries of the subway system,” he realized that performers always put a smile on his face. His ode to them, the short documentary film Below New York, has now won awards worldwide, and continues to play the film festival circuit. When Wingate first got to NYC, he lost six pounds in two weeks because he couldn’t afford to both pay his rent and eat. Now, he makes enough money performing in the subway to support himself. It’s not always the most glamorous job, and buskers can never count on a steady income. But, on occasion, Wingate earns $100 an hour from the people passing by. Eat your heart out, Joshua Bell.